Classic French fashion is all about timeless looks, pristine tailoring, and stylish details. La Queue du Chat (that's "Cat's Tail" for all you non-Frenchies) brings the same vibe to a line of baby and children's clothing. The whipped cream on top: the entire line is GOTS-certified organic and fairly traded. As you'd expect, La Queue du Chat features fun details such as smocked collars, contrasting colors on cuffs, and cute graphics. The colors are rich and vibrant, yet a far cry from the garish hues that saturate many children's clothing lines. 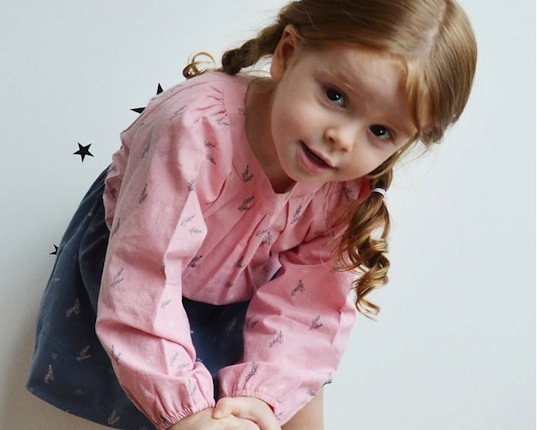 For girls, the line includes romantic but practical separates such as blouses, cardigans, and leggings as well as patterned dresses (including the utterly adorable hop hop with bunnies). Items for boys include polos, pullovers, hoodies, and jeans, with several featuring funny little monsters. For babies, there are many mini-me versions of the boys’ and girls’ lines, as well as onesies with cross body snaps and kimono tops. Along with everyday wear, La Queue du Chat also has cozy sleepsacks, matching headbands, and versatile travel changing mats, also in cheery patterns. La Queue du Chat goes the ethical and eco-distance too: scraps of material are recycled, azo-free and water-based inks are used, the company donates clothing to charities that assist homeless mothers, and the company provides financial assistance to an orphanage in the part of India where there clothes are manufactured. For girls, the line includes romantic but practical separates such as blouses, cardigans, and leggings as well as patterned dresses (including the utterly adorable hop hop with bunnies). Items for boys include polos, pullovers, hoodies, and jeans, with several featuring funny little monsters. For babies, there are many mini-me versions of the boys' and girls' lines, as well as onesies with cross body snaps and kimono tops. Along with everyday wear, La Queue du Chat also has cozy sleepsacks, matching headbands, and versatile travel changing mats, also in cheery patterns. La Queue du Chat goes the ethical and eco-distance too: scraps of material are recycled, azo-free and water-based inks are used, the company donates clothing to charities that assist homeless mothers, and the company provides financial assistance to an orphanage in the part of India where there clothes are manufactured.